Without much change in the weather, the surest way to know it’s fall in San Diego is by the arrival of the Dirt Dog cross country season. PRT started the season with a bang at the Wild Duck 5K, with a clean sweep of wins by Tyler Underwood, Paul Wellman, new member Natalie Hopkins, and Amy Halseth. Jamaal Ryan and Jason Batterson turned in strong performances at the hilly Balboa 4 Miler, finishing one second apart in 2nd and 3rd in the Masters Men’s race. Coming off a tough fall at that race, Celest Arambulo turned around to nab the Masters Women’s win at the newly-extended-to-10K Perros Bravos race in Bonita, while Jason Batterson took the Masters Men’s title. The series returned to shorter races with the Crazy 8’s 5K, where Jamaal Ryan notched a win and Fiana Kumm took second place in the open race. Jamaal’s winning streak continued at the Balboa Boogie 5K, while in the open races Oliver Langford and Elizabeth Ryan were PRT’s top performers. Fiana won the Open Women’s race at the Cuyamaca 6K. In the Championships race, the scoring team of Fiana, Erin Menefee, Sofie Schunk, and Bridget Nolan was narrowly defeated (by one point) by a strong boom running team. Fiana finished ranked 2nd in the championship race and the series for Open Women, while Celest finished 3rd both in Champs and the series for Masters Women. In the Open Men’s race, Tyler Underwood (2nd) and Oliver Langford (6th) finished in the top ten, while Derrick Lloyd, Derek Bradley, and new member Jonathan Fenton rounded out the scorers for PRT. Jason Batterson finished 3rd in the masters race and 2nd in the series standings. The men’s 50+ team, led by Kevin Zimmer, took the Dirt Dog title for their age division. To close the cross country season, Jason, Paul, Scott McEntee, and Tracy Wright made a special trip to Spokane, WA to compete at the USATF National Club Cross Country Championships. In addition, many PRT members took to the roads for half-marathon and marathon races. Highlights included three Olympic Trials qualifying marks amongst the women’s team - Marie Zanderson (Berlin Marathon), Hilary Corno (Chicago Marathon), and Elizabeth Ryan (2nd OTQ, California International Marathon). Members who notched marathon PRs in the fall included Angela Moll (twice - both at Berlin and CIM), Derrick Lloyd (New York City Marathon) and new member Mary Schneider, Kevin Sorrell, and Brian Coullahan (CIM). 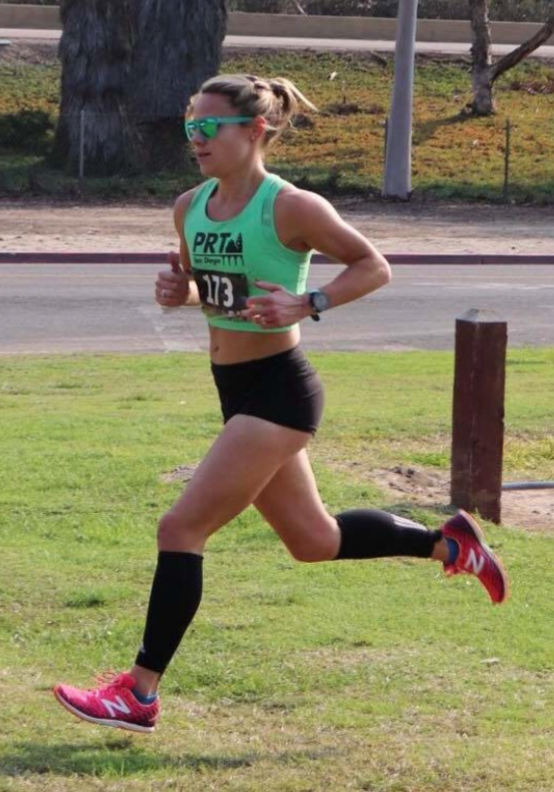 PRT athletes also competed in the Kaiser Thrive Half Marathon and Holiday Half Marathon locally in San Diego, with Bridget Nolan notching nearly a 6 minute PR on the favorable Holiday Half course. After a break for the holidays and a party to celebrate everyone’s accomplishments in January, the team is ready to take on 2019!